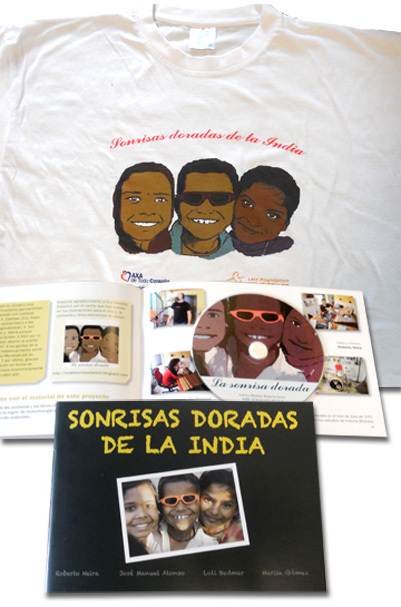 AXA de Todo Corazón presented in the Fourth Assembly of the Club Diálogo, the photo exhibition “Sonrisas doradas de la India (Golden Smiles of India)”. This is an initiative of two of its commissioners: Roberto Neira and José Manuel Alonso, General Agents of AXA, to support children in situations of social exclusion in India. The photographs are on display in the lobby of the AXA building in Madrid and show us pictures of India’s day to day life. Roberto Neira, José Manuel Alonso, Loli Gomez Bedmar and Marisa are the authors of these photos that were taken during a trip to India where they lived at first hand the reality of a fascinating culture full of sharp contrasts. The aim of the exhibition is to raise funds in support of Laia Foundation through the sale of T-shirts (8 €) and a kit with a photo album and a CD (12 €).